Moving time: 4 hr 49 min. Weather: 55°F (13°C) in the morning; got up to 80°F (27°C) by the end of the ride at 3:00 pm. Partly cloudy; turned to mostly cloudy 10 miles before Cameron. Very small amount of rain before Ennis. Today was another great day of riding. Joe and I said goodbye to Pat and Kelly in West Yellowstone after a hearty McDonald's breakfast. They are on their return leg to Pennsylvania and expect to arrive there within the week. Most of the ride was a gradual downhill grade along the Monroe River and we had a significant tailwind for about 40 miles of the trip. We met a group of 26 riders from Seattle who were riding the opposite direction (uphill with a headwind). They were sag supported so I didn't feel too bad for them. Southern Montana is very beautiful and much greener than Colorado and Wyoming. The rivers here actually have water in them unlike the numerous dry river beds and empty reservoirs in Kansas, Colorado and Wyoming. Here are two shots of me riding. 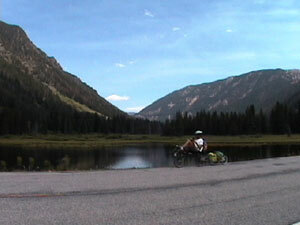 The first was taken along the Hebgen Lake and the second is just north of Quake Lake. 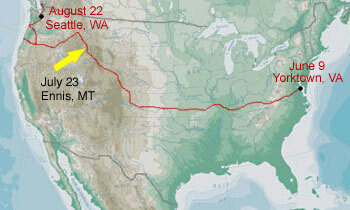 In August of 1956 a major earthquake measuring 7.5 on the Richter scale hit the Madison River Canyon area. Hebgen Lake tilted upward; cabins on the north shore were immersed in water, while portions on the south shore lay high and dry. Water sloshed back and forth in the lake and the dam cracked. Further downstream a tremendous landslide sent 80 million tons of rock into the canyon, blocking the Madison River. Hundreds of vacationers and residents were trapped in the area as the highway fell into the river. Within weeks the U.S. Army Corps of Engineers cut a spillway into the rock slide to alleviate the pressure on the slide since there was risk of it breaking and flooding the area downstream. The Quake Lake and scarred mountainsides stand today as reminders of one of the largest earthquakes in U.S. history. 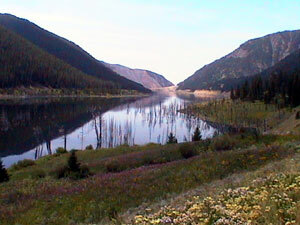 Here is a shot of Quake Lake showing the flooded trees that still stand today. I have been warned by other cyclists about the severe weather that shows up out of the middle of nowhere. Some very serious storm clouds brewed very quickly and threatened us during the last 20 miles of the ride. 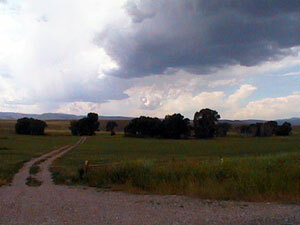 It rained for a very short time just before reaching town and then a few more times later in the evening. 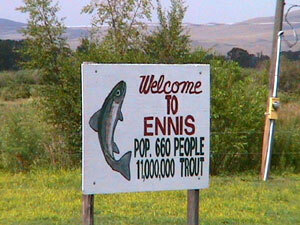 We stayed in Ennis, Montana at a hotel that certainly caters to fishermen. 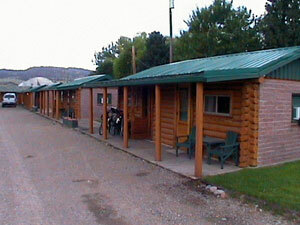 This is a huge trout fishing region with many, many fishing outfitters and guides.